Old outfit,new accessories! Loving my new yellow circle scarf from my husband and green converse from my parents. Not loving my puffy face. At my doctor’s appointment on Monday, we discovered the baby has flipped head up again. BOO! I’m not happy about it. I have an appointment with the perinatologist on Monday, when I’ll be 37 weeks, and if he hasn’t flipped back by then, I have a feeling my doctor is going to want to schedule a c-section. Two weeks ago, he said that if he was breech, we could schedule a c-section at 38 or 39 weeks. 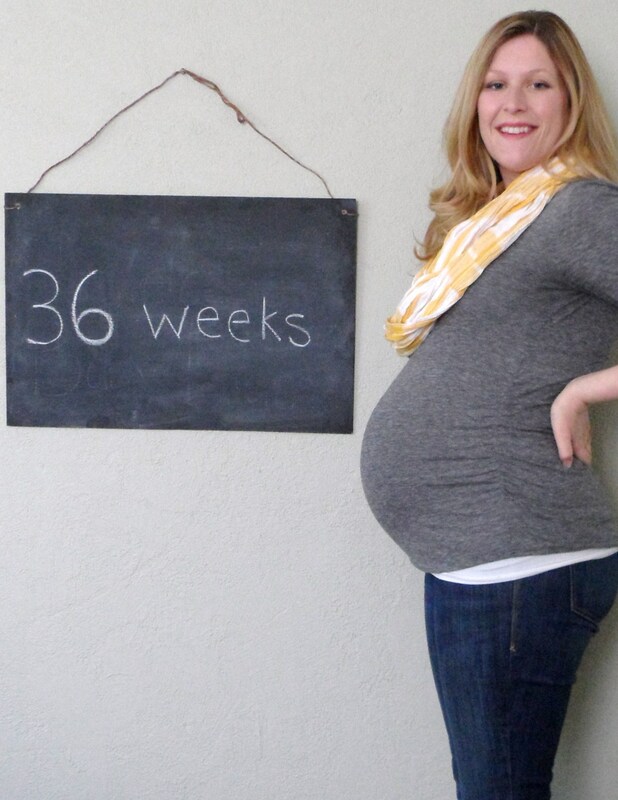 38 weeks?!?!? I’m 37 on Monday!!! Holy guacamole!! While I really really really don’t want a c-section, I’m starting to come to terms with the idea that I might not have a choice and if it has to happen, it won’t be the end of the world. It’s hard to let go of my vision of the birth experience I hoped to have, but if I’ve learned one thing over the last couple of years, it’s that sometimes things work out better than we could have planned. We started our baby care basics class this week. It is a little too late for my liking (ends at 9:30pm, when I’m usually in bed), but the first class was good and we learned a bit. The instructor has already said some things I don’t agree with, but I just smile and nod. I’m constantly writing notes to my husband during class to make sure he knows the other side of whatever she’s saying. I definitely liked our childbirth instructor better, but she doesn’t teach this class, unfortunately. She does teach the breastfeeding class, though, which is this Saturday. I’m excited to learn some tips and tricks that I haven’t already read about, but I’m not excited to have to wake up early on the weekend and sit in class when I’d rather be in bed or working on the baby room. Yes, the only two things I want to be doing lately are sleeping and nesting. Only three more weeks left of work (if I can make it that long)! Each morning, I tell myself “one more day” and that’s how I get through the week. It helped that this week I had my work shower, so it was something to look forward to. I got a big basket of books (what else would I expect from a bunch of English teachers?) and some clothes. It was very sweet of them to put it together and I felt so special. Do you have any fun and exciting plans for the weekend? Do tell because I want to live vicariously through you. Hmm, fun weekend plans: my sister is moving to Wyoming (oh, hi, random!) so her going-away party is on Saturday. Should be fun! Thank you so much! I hope you had a great time! You are SO pregnant! I love it! Can’t wait to meet Mr. Liam!! I have been lurking on your site for a while, and reading you since you were on Spearmint baby. 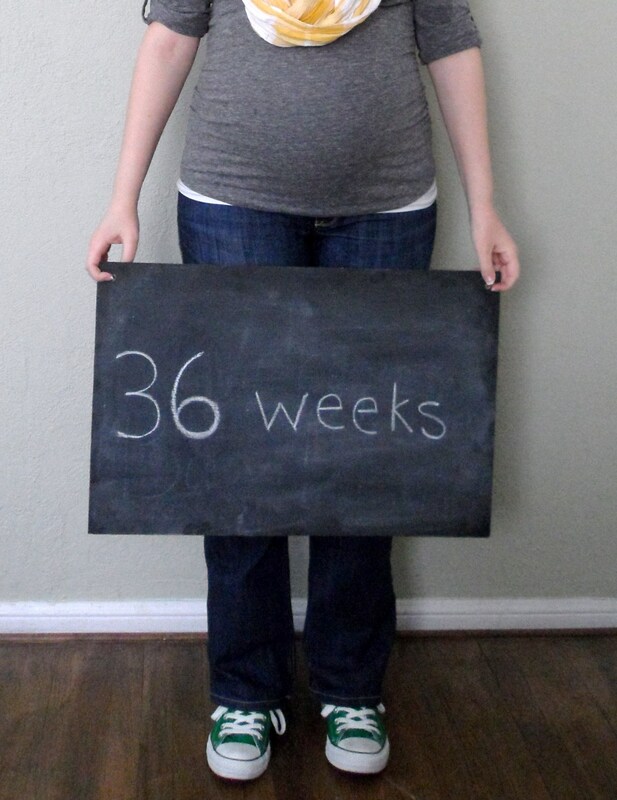 I am only a few weeks behind you in pregnancy, I am 33 weeks today! Everytime you update, it reminds me how close I am to the end! My baby was breech until 28 weeks, and at my 31 week appointment, my midwife (a new care provider for me) told me that he is head down, but this week, all of a sudden I start feeling strong movement down low again. Hoping he didn’t flip! I hope he stays head down for you, too! Enjoy these last few weeks of pregnancy!! Love the outfit especially those green Chucks! So cute!